Seattle Chamber Music Society’s 2016 Summer Festival reunites longtime favorite musicians with newcomers including mandolin star Chris Thile and the concertmaster of the Berlin Philharmonic in a month of classics and surprises, from July 5 to 30. 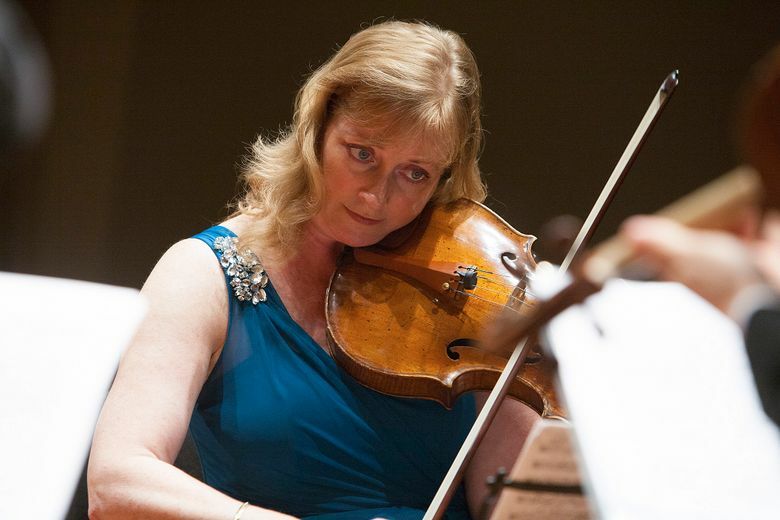 She’s referring to the spirit of relaxed camaraderie that makes the Seattle Chamber Music Society’s Summer Festival so appealing to like-minded musicians. It somehow manages to blossom without fail, despite the frenzied schedule of classics to polish and new pieces to learn. For Phelps — who spends the regular season as principal violist of the New York Philharmonic — the Emerald City has long been a home away from home during the four-week festival SCMS presents each summer. The 2016 edition launches Tuesday, July 5, and runs through July 30. Offering 12 different concerts and related events (including a free performance in Volunteer Park on July 27), this 35th-anniversary festival convenes 49 musicians from around North America and Europe. In 1987, during the early years, Phelps got her first taste of the collegial atmosphere she admires. It was enough to make her decide to keep coming back — one of a loyal core of musicians who have become longtime regulars at the festival. Along with those familiar faces, the 2016 festival will feature 13 newcomers, including such prominent musicians as violinist Noah Bendix-Balgley, concertmaster of the Berlin Philharmonic; pianist George Li, silver medalist in last year’s Tchaikovsky Competition; and Stephen Williamson, principal clarinetist with the Chicago Symphony Orchestra. James Ehnes, who took over from festival founder Toby Saks as artistic director of SCMS, has been a festival regular since 1995, when he was 19. An internationally acclaimed violin soloist, Ehnes points out that the programming he devised for this month aims for a balance between pieces for smaller and larger forces. Ehnes spoke by phone the day before he flew to Seoul, South Korea, to play the complete string quartets of Beethoven with the James Ehnes Quartet, an ensemble comprising fellow SCMS regulars (with violinist Amy Schwartz Moretti, violist Richard O’Neill, and cellist Rober t deMaine). 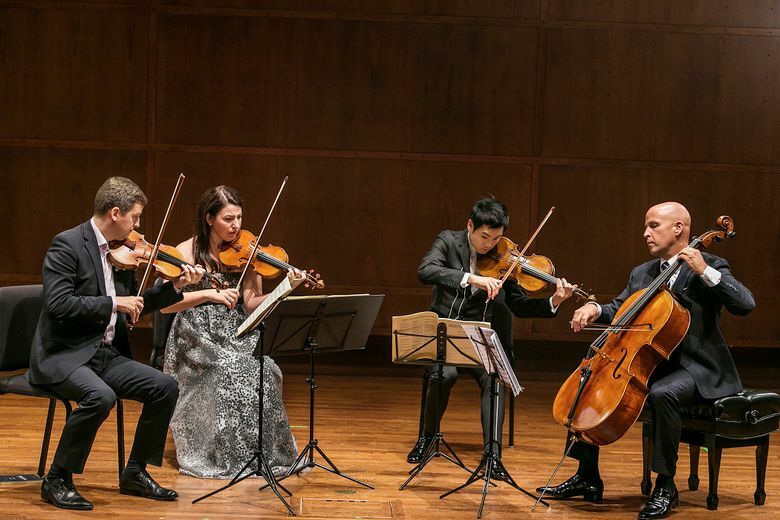 Within days of returning from their Korean Beethoven cycle, the Ehnes Quartet will inaugurate the Summer Festival (July 5) with two of the composer’s quartets: an early quartet during the free prelude recital and the matchless Op. 132 A minor Quartet in the concert’s second half. “The A minor Quartet is the most profoundly moving piece I know,” Ehnes says. If you’re convinced you’ve encountered all the Beethoven there is to hear, the program July 8 may hold a surprise: a couple of early pieces the composer wrote for a patroness who played the mandolin. The performer will be Nickel Creek mandolin virtuoso and Grammy winner Chris Thile. Thile will play two concerts (July 8 and 11) and a special late-night concert at the Triple Door on July 8. After the positive reactions to a narrated performance of Stravinsky’s “The Soldier’s Tale” two years ago, Ehnes wanted to explore that theatrical vein again by presenting William Walton’s “Façade,” a scandalous “entertainment” from the early 1920s that made the young British composer famous (also on the July 8 program). Thomas May writes about the arts for a variety of publications. His books include “Decoding Wagner” and “The John Adams Reader” and he blogs at www.memeteria.com. On Twitter @memeteria.